THE NEW YORKER 8/6/08 Night Life preview - JALOPY THEATRE:The country-blues singer, songwriter, and barrelhouse guitarist Spider John Koerner�one-third of the obscure yet legendary sixties folk trio Koerner, Ray, & Glover�has been performing in the bars and folk clubs of the Twin Cities ever since Bob Dylan was enrolled at the University of Minnesota (he was one of the first to turn Dylan on to folk music). Bonnie Raitt covered one of Koerner�s songs on her d�but album, and his fans have included John Lennon and David Bowie. His influence on twentieth-century music aside, watching Koerner perform might be the closest you can get to understanding how, more than eighty years ago, Charley Patton alone on guitar kept a roomful of people dancing and partying until the sun came up. VANITY FAIR in November 2003 Blues, Rags & Hollers Article: David Bowie's Top 256 CD Wish List: "Bought at Dobell's. In his own way, 'Spider John Koerner' was an influence on Bob Dylan, with whom he used to play in the coffeehouse bars of Dinkytown, the arty section around the University of Minnesota. Demolishing the puny vocalizations of 'folk' trios like the Kingston Trio and Peter, Paul and Whatsit, Koerner and company showed how it should be done. First time I had heard a 12-string guitar." "Long before Soul Asylum, long before Prince, there was a thriving music scene in Minneapolis. Its foremost export was Bob Dylan, but he wasnt the only major talent. Spider John Koerner, Dave Snaker Ray and Tony Little Sun Glover performed in area coffeehouses, recorded in various combinations and made an important contribution to the folk revival of the early sixties. Some 3 decades after it appeared, their first album, Blues, Rags & Hollers is reissued, and sounds as good to me now as it did then. As a trio, K,R&G brought a raucous highly rhythmic approach to the acoustic blues that effectively captured the essence of their forbears.
. Koerner brought a delightful sense of humor to his pounding rags. Buy it, then write letters to Red House demanding they reissue everything else." "..the most innovatively brilliant acoustic blues musician of his generation." time hasnt disguised his inimitable sound." "His guitar picking is faster n cleaner than ever, his voice is as strong n smirkin as it was in 63, and the material that he does is great. He just bowls ya over with a combination of chops and sheer mother power." "John was the Old Venerable One, the guy that influenced a lot of other musicians that would come up. It was like having a big celebrity living right in town (Cambridge,MA). He became the fulcrum of the whole scene. I watched his hands, I learned a lot of things from him. It looked like he was having fun & thats just what I wanted to do & thats why Im doing it still." BONNIE RAITT from NPRs "MORNING EDITION"
"He has a real unique style of guitar playing & a great talking blues style of delivery. They just dont make anybody like Spider John Koerner. They broke the mold. As all great originators, like Woody Guthrie or Bob Dylan, anybody else who tries to imitate them would just look like that, an imitator. I do "I Aint Blue" in my shows and recorded it on my first album. Its one of my favorite songs of Johns, but his other songs I love to play just for my own enjoyment; but I can never come close to playing them as well as he does." "I want to welcome a guy here Id sure like to introduce to you fully but hed be too embarrassed if I said everything I could say about him. 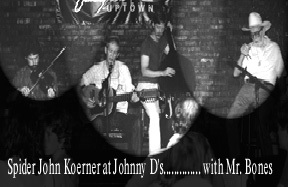 Mr. John Koerner is a favorite musician of mine, a great pool player & he speaks Danish as well."